Finally seeing some progress with Musette la Plume (cat) and Josie O (Chihuahua puppy). The basic problem was that Josie would run toward Musette ’cause she wanted to meet her. Musette, a real dogophobe, would freak out and run, and this set the pattern for their encounters. 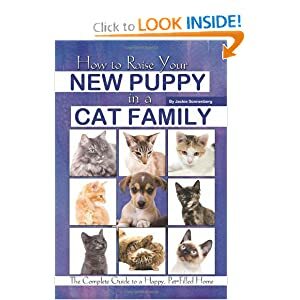 Before I brought Josie home to live with Musette , I bought this book. One suggestion that made this book worth buying was that you feed the animals treats when they’re in the same room, to give them a positive association with the other one’s presence. I don’t think that’s how it works. I think that the treats 1) distract Josie so she doesn’t pay attention to the cat, and 2) eventually teach her that if she sits in one place while the cat is around, she’ll get treats. Essentially, I’m training her to “stay” in the cat’s presence. For Musette’s part, the treats 1) give her a reason to be near the dog, and 2) probably make her think, “If that animal can be distracted by treats, it doesn’t want to get me all that much.” However it’s working, Musette is coming downstairs and wandering around more, even when she sees Josie is there. It took a month, and I know I made some mistakes along the way, but finally things are heading in the right direction. It helps to have a smart dog. Having a super-wimpy cat is no help at all, bless her. There have been compensations. Musette’s insecurity about the situation has made her revert to earlier, more affectionate behavior. We have never let her sleep with us (I have allergies, Angel Joe has trouble sleeping). It used to be that when we opened the bedroom door in the morning, she would rush in, jump on the bed, and throw herself down for morning petting. Then it switched to the floor, and then petting time got shorter and shorter until she basically said, “All right. Fill my dish, open the pet door, and let’s get this show on the road.” Well, now she’s back on the bed. Haha.